Beck and Call or Beckon Call – Which is Correct? Home » Beck and Call or Beckon Call – Which is Correct? If you are expected to be immediately available for any reason at any time, are you at someone’s beckon call or beck and call? These phrases are a source of confusion. Beckon and beck and are near homophones, and beckon and call even have one similar meaning. Still, only one of these variants is considered standard. Continue reading to learn which one. What is the Difference Between Beck and Call and Beckon Call? 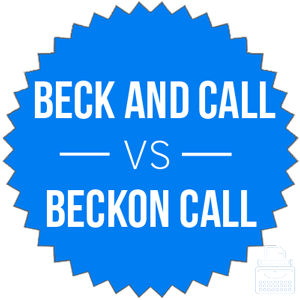 In this post, I will compare beck and call vs. beckon call. I will go over the definition of this phrase and outline the correct spelling. Then, I will show how the phrase is used in context with sentence examples. Plus, I will show you a helpful memory tool that will make choosing beck and call or beckon call much easier. What does beck and call mean? Beck and call is an idiom that is synonymous with on a whim. The term typically appears in phrases like at her beck and call, which means readily available at a moment’s notice. A beck is a short physical gesture (like a hand wave), while a call is, in this case, a verbal signal to get someone’s attention. Thus, at my beck and call could literally be taken to mean at my wave and shout. New interns always hover at the office door, eager to prove their usefulness at the director’s beck and call. “You just want me here at your beck and call so we can go out on nights your other girls are busy!” accused Janet. What does beckon call mean? Beckon call is a misinterpretation of beck and call, based on the phonic similarity of beckon to beck and. It’s easy to see why this phrase confuses people, since beckon means to call someone. According to Bryan Garner (2016), this type of misinterpretation is called a mondegreen. Mondegreens occur when someone mishears spoken language and transcribes it to written language. Mondegreens are common in situations like song lyrics and court transcripts. Still, beckon call is not an acceptable variant of beck and call. As you can see from the chart below, which graphs beckon call vs. beck and call over time, beck and call is much more widely used than beckon call. Other misspellings of the phrase are becking call and beckoned call. When thinking of this specific phrase, beck and call is the only correct spelling. Beckon is a colorful verb by itself, and it can make your writing more interesting if used intentionally. The misinterpretation beckon call, however, is an error that should be avoided. To remember to always use beck and call, keep in mind that beckon and call essentially mean the same thing, and to use them in the same phrase is redundant. Is it beck and call or beckon call? Beck and call is a phrase that is synonymous with on a whim. Beck and call is the correct spelling. Beckon call is a misspelling. 1 What is the Difference Between Beck and Call and Beckon Call? Because vs. Since – What is the Difference? Bi-weekly vs. Semi-monthly – What’s the Difference?